On the 29th November 2017, Councillors approved this planning application on the planning officer’s recommendation. The Society strongly supports Council policy to increase the number of residents in the city centre and the redevelopment of this prominent site. The Society is disappointed with the outcome of the planning process that could have produced a much better scheme. The Old Market Community Association said, and the Society agrees, that there is a fundamental objection to a 26-storey tower on the corner of Castle Street and Tower Hill. It is not necessary to exceed the height of the nearby building, One Castlepark. The ‘tower’ will intrude onto the street scene and detract from the many listed buildings in Old Market. It will dwarf the Central Hall cupola, a local landmark. A building the same height as One Castlepark would not have the same effect; it would continue the gently curving line of the southern side of Old Market Street. The OMCA proposed a different design that would have achieved the same housing density. The proposed buildings lack architectural ambition; they are bland and lack articulation and create no local identity. The development will not contribute to the improvement of Castle Park’s east end or remove motor vehicles to enable Castle Street to become a cycle and pedestrian route. The provision of affordable housing is not policy compliant. The development will achieve a low level of affordable housing on a site that the Council part owns. The site of the former Central Ambulance Station lies between the south-east corner of Castle Park on land owned in partnership by the Council and the Homes and Communities Agency. 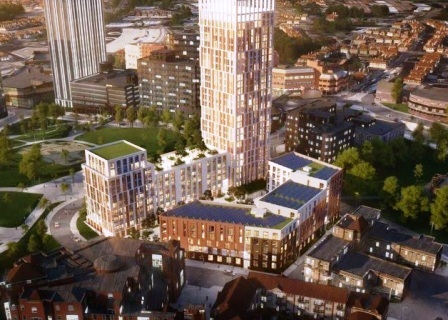 Linkcity, a property development company, wishes to build 375 new homes and include a 26-storey tower block. The Council say that 20 per cent of the development would be affordable housing, with 58 units set aside for social rent and 17 for shared ownership. From 2015, the Society attended the developer’s meetings and workshops. The Society is disappointed that the scheme remains unchanged and uninfluenced by any of the constructive responses from the Old Market Community Association (OMCA), with whom it worked closely. The Society strongly supports the development of this site and regrets that it opposes the current scheme. The site is wholly within the adopted Old Market Quarter Neighbourhood Development Plan, to which there is no reference. Other developers, (the former Print Hall) embraced the ideas laid out in the plan. There is only one 3-bedroom flat out of a total of 375. A site in public ownership should have created flats that could house families in the city centre. A 26-storey tower will greatly exceed the height of the adjacent building, One Castlepark. The tower will harm the street scene, detract from the Old Market Conservation Area and dwarf the Central Hall cupola; a local landmark. The tower will dominate the views from Castle Park with greater prominence than the Eclipse and Castlemead towers. The Society would accept a tower that steps down from the Marriott Hotel (13 storeys) towards the south west to create a visual link to the Finzels Reach development. There is no reason to make the tower ‘an iconic landmark’. The site forms an edge to Castle Park, the development should be a backdrop to the trees around the park edge. Castle Ditch could be partially opened into an attractive feature in the centre of the site. The site is gated off with no public access unlike the Finzel’s Reach development which is accessible. This space should include a public right of way to link the end of Jacob Street with the end of Queen Street and to Castle Park. The design is unambitious. More articulation of the blocks is required in terms of finesse to make the bulk/ silhouette of buildings interesting and fitting to this prestigious and prominent site. The scheme fails to remove motorised vehicles from Castle Street to create a cycle and pedestrian route to mark a formal eastern entrance to Castle Park. There should be a developer’s contribution for improvements to the eastern end of Castle Park and enhancement of Castle’s vaulted chambers. To locate this site, use this link to the Old Market Neighbourhood Planning area. Use this link for the OMCA response [PDF, 400KB], which the Society supported. It gives the full reasons why the scheme conflicts with local planning policy.